The Multiversity #2. Grant Morrison- Writer, Ivan Reis- Penciller, Joe Prado, Eber Ferreira & Jaime Mendoza- Inkers, Dan Brown, Jason Wright & Blond- Colorists. From Grant Morrison’s earliest work for DC Comics with his acclaimed run on Animal Man in the late ‘80’s, he has played with the fourth wall and meta-textual messages. At times his work is completely misunderstood and often criticized for being too dense or too esoteric to be enjoyed. However, I would posit that he is never obtuse on purpose, but rather not all readers are going to get the metaphor he is using. This rings completely true with The Multiversity #2, and in a sense the whole series. While the issues that explored the different worlds were largely understandable for what they were, The Multiversity #1 had the burden of setting up the concept and putting for the story in motion. This was a fairly straightforward issue despite the introduction of so many parallel worlds and new characters. However, the basic concept is not that hard to grasp, so it was fairly easy. With The Multiversity #2, Morrison has to finish a story that is essentially 2 issue’s long with a number of mini-bumps along the way that add to the concept but don’t manage to push the story that far along. So finally, with The Multiveristy #2, we get a conclusion to this story, or is it a beginning? Ultimately, it is another comic book that is meta-textual and pushes against the fourth wall, and is a critique on comics. I believe that Morrison is saying that the concept of the multiverse in DC Comics is essentially what brings the element of fun into the company’s comics. 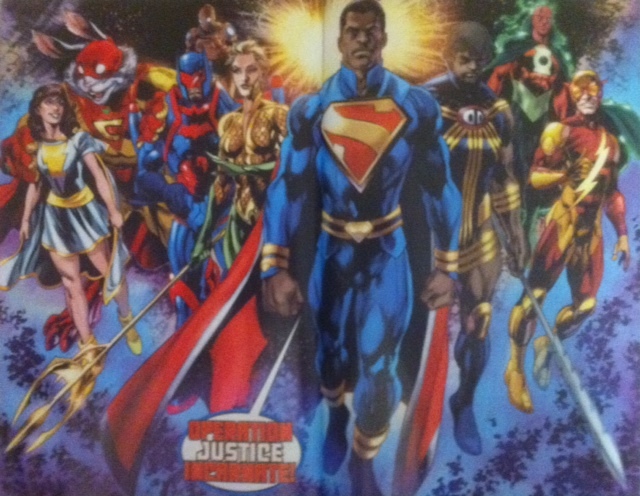 I believe that The Multiversity attempts to show that without the multiverse that DC Comics become all too similar and don’t allow for a diversity of stories and genres and that the hegemony at the company end up allowing a house style that ends up homogenizing the line and ultimately kills it if the concept of the multiverse is not allowed to return periodically. However, Morrison also reveals that the company is ultimately holds the power for which characters live and die and they are all at the whim of editorial, despite what Superman says, they approve what he says after all. You cannot read this series without the understanding that you yourself are a player in this story, because you, the reader are included as a participant. Not solely because you are reading, but because Morrison is writing you in as a part of the actual story, because he is essentially giving an in-story explanation for the creators of comics- an IN STORY reason. Yes, I had to read this issue twice. 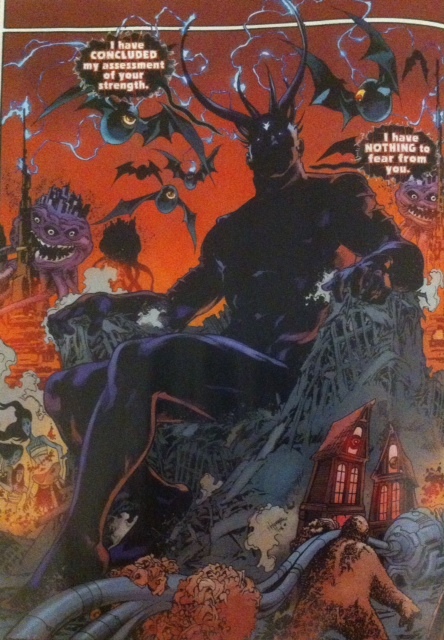 So, the issue opens with the Gentry and Harbinger intertwined as they both become aware of Etrigan, the Super-Demon and his team facing off against the Sivannas of the multiverse, and the Vampire Justice League of Earth-43. The Vampires are defeated by a craving for coffee (only the multivese could produce a ridiculously fun concept), and a Sivana and Mr. 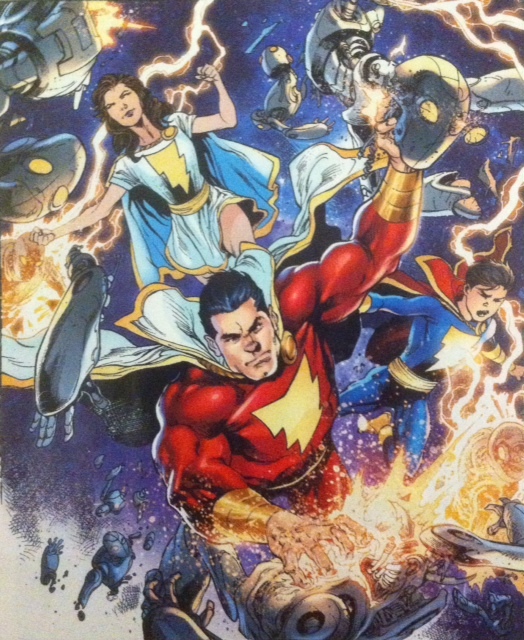 Mind escape to the world of the Justice Riders as the Marvel Family from Thunderworld approaches. And it doesn’t look like Sivana and friend will survive this experience. 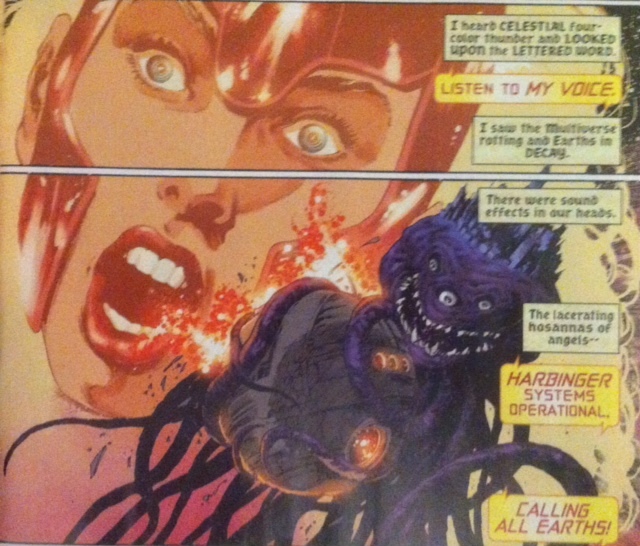 The scene quickly switches to the incoming to the Orrery of worlds the characters who have been summoned from across the multiverse to respond to the threat that was introduced in the first issue. As Dino-Cop tries to assemble the heroes into some sort of organized unit, it becomes apparent that the Lil’ League are actually spies for the Gentry- it was obvious all along, right? This takes us quickly to Earth-8 where Nix Uotan, under the influence of the Gentry is about to solve a Rubik’s cube and bring about an end to the multiverse. That makes sense right? I mean, why not, Rubik’s cube and Crisis on Infinite Earths are both from the ‘80’s and Crisis ended the DC mulitiverse, right? Working together, but apart Captain Carrot and Aquawoman of Earth-11 stop Uotan and get him away from the influence of the Gentry so that he’s back on the side of the angels. Now really, stop and think about the significance of this, the two most influential characters in the story are a funny animal and a female version of the most ridiculed member of the Justice League of America. Let it sink in. Only in a multiverse could this happen. Only in a multiverse could a reader have this kind of fun. Fun. Next, Red Racer delivers the final blow as he knowingly re-enacts the actions of Barry Allen from Crisis on Infinite Earths, his favorite comic. Morrison is clearly relying on the reader’s knowledge of comics to expand the understanding of the story while firmly placing the reader in the story as another reader of Crisis on Infinite Earths. As Nix Uotan is brought to his senses, the Gentry arrive to cause more mayhem. This leads the grouping of heroes to Earth-7 which was annihilated in issue #1. Here they encounter a being that represents editorial and the creative branch of DC Comics. Morrison makes it clear that this being ultimately controls the fate of all the company’s characters and as the reader we know it, too. 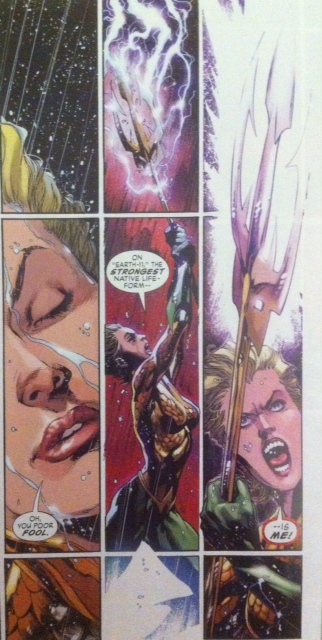 In-story, there is some bold posturing from the Superman of Earth-9, but the reality is clear. 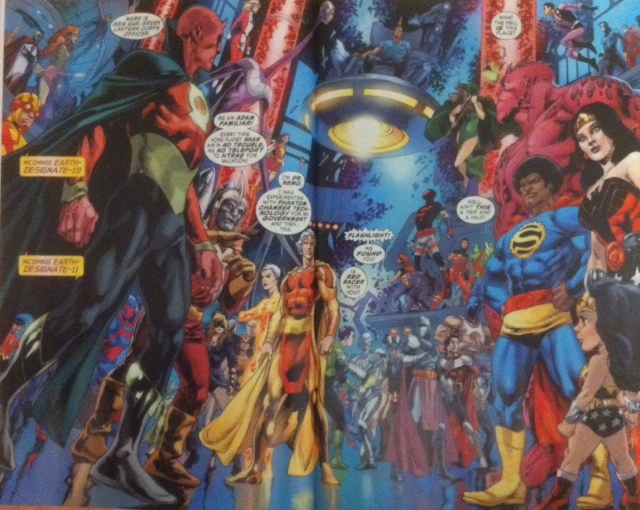 The heroes are shunted back to Earth-8 by editorial and then the Orrery of Worlds by Harbinger and under Superman’s leadership they form Justice Incarnate, a multiversal league of heroes. 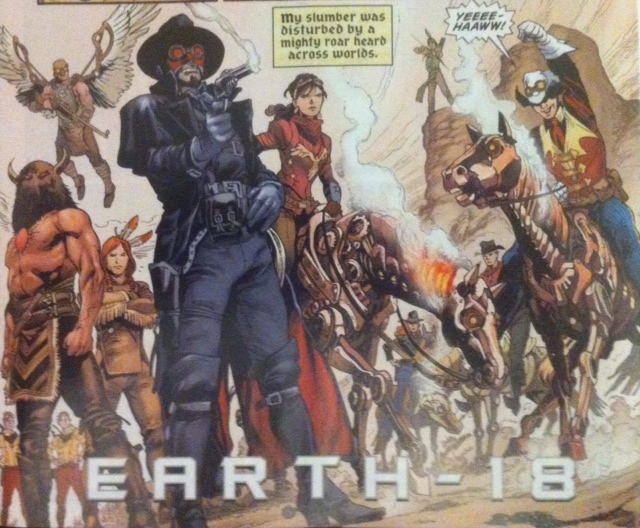 Lastly, Nix Uotan returns to his duties and the scene switches to Earth-0, Prime Earth, main DCU continuity Earth as his counterpart is reading the comics when we first met him in The Multiversity #1. Remember, Earth-33 is Earth-Prime, our Earth and the home of Ultra Comics is Earth-33. You get it right? My head exploded at this point, too. I’m still trying to find all the pieces. The multiple levels on which this series works is the biggest positive. It is truly unique in comics. Nothing has ever been done quite like this. It is worthy of respect solely for the attempt, but that fact that it succeeds is an extra bonus. The complexity of this series could be a turn off for many readers. Not everyone wants a story that requires this much effort. It does work on the most basic level as a straight forward level of multiversal Crisis, but in that regard it’s not that strong. 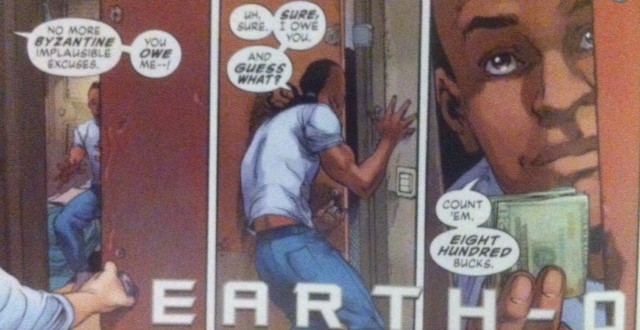 Like most of Morrison’s work, The Multiversity #2 asks a lot of the reader. For those willing to invest the effort it is exquisite. His exploration of the fourth wall and meta-textual storytelling is singular. Batgirl Rises – The Explosive Finale is here!